John Thwaites studied on the Joint Course between Manchester University and the Royal Northern College of Music, at the Guildhall, in Siena, Vienna and (as the recipient of an English Speaking Union scholarship) in the United States. His teachers included Harvey Dagul, Sulamita Aronovsky, Paul Berkowitz, Martino Tirimo and Christian Blackshaw. 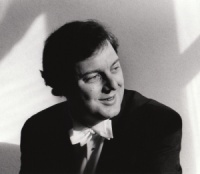 In addition to early recitals for the Park Lane Group and Live Music Now!, John won the 1986 North West Arts Young Musicians' Platform with bassist Leon Bosch. Both were founder members of the Music Group of Manchester (1986-'93) undertaking innovative projects such as commissions and a Tchaikovsky tribute with Tim Piggot-Smith for the Royal Exchange Theatre. John has been working with Alexander Baillie for thirty years. They appeared in the first and last Manchester International 'Cello Festivals, released a recital CD in 2000, and selected live performances in 2009. Another longstanding association is with Sue Lowe's 'Cello Schools, and John has performed with Johannes Goritzki, Louise Hopkins, Pierre Doumenge, Li Wei, Oleg Kogan, Melissa Phelps, Alexander Ivashkin, Alexander Boyarsky, David Cohen and Natalie Clein. Alongside relationships with the Schidlof, Maggini, Emperor, Martinu and Brodsky Quartets, a performance of Lyapunov's Sextet with the Dante Quartet on Dutton Digital was BBC Music Magazine's chamber music choice for November 2004. Two discs of British repertoire, a double Strauss disc, contemporary disc, and Brahms/Faurè disc have been released on Meridian by the Primrose Piano Quartet (Stanzeleit, Ireland, Fuller, Thwaites). The Primrose gave the 2006 Hurlstone Centenary Recital at the Wigmore Hall, and commissioned a new piano quartet from Sir Peter Maxwell Davies which was premiered at the 2008 Cheltenham International Music Festival. John is also a member of the Audley Horn Trio (Stanzeleit, Stirling, Thwaites). Recent concerto performances include Grieg at St. John's Smith Square, and Tchaikovsky at the Royal College of Music. A solo disc of Romantic Favourites will be released in 2010. He is regularly invited to festivals such as Stift in Holland, Cotes des Isles in France and Pro Corda in Britain. John Thwaites has broadcast regularly for BBC Radio Three in live Lunchtime Recitals and as a guest on "In Tune". He has appeared on television and radio in Germany, Ireland and Bulgaria. As Chamber Music Director for the Horsham Festival, promotions included a Bax Weekend and Britain's first Complete Series of Brahms's Chamber Music (taking the seventeen piano parts). John conducted the Bridge of Weir and Greenock Philharmonic Choral Societies for many years, and in March 2008 gave a joint performance of Verdi's Requiem with the musicians of the BBC Scottish Symphony Orchestra. Having run the Piano Department at Christ's Hospital, and taught at the Guildhall School of Music and Drama, John is currently Head of Keyboard Studies at the Birmingham Conservatoire, and Course Director of the Cadenza International Summer Music School, a piano and strings festival resident at the Purcell School, London, in July.